This artificial system attempts to depict the ego-centric nature of intelligent life forms. It is worth pointing out that screenshots are fairly limited in capturing the patterns of motion that the individual objects take on, which make up the essence of this particular system. I started out playing around with a single egg, giving it a rocking motion, the cyclical tilting of which resembles a daruma doll. 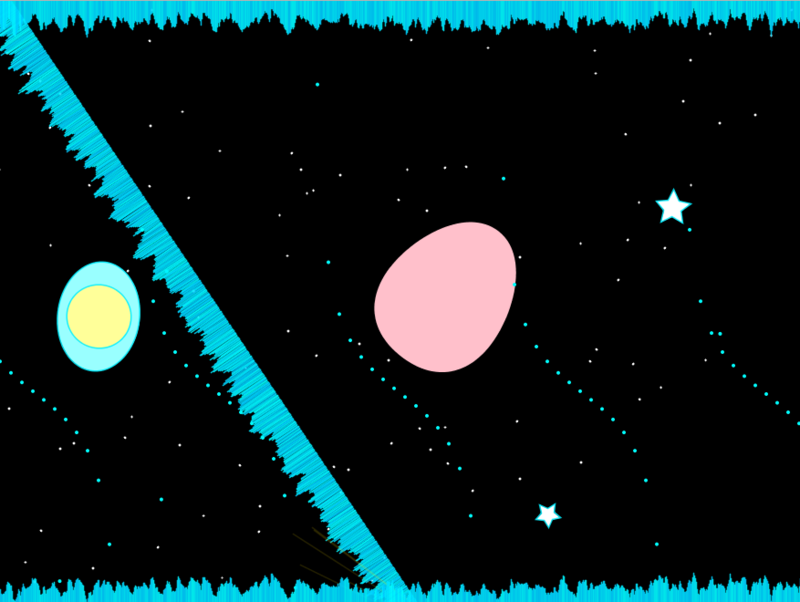 The wavy line (sine wave) underneath is a portrayal of a simplistic environment. 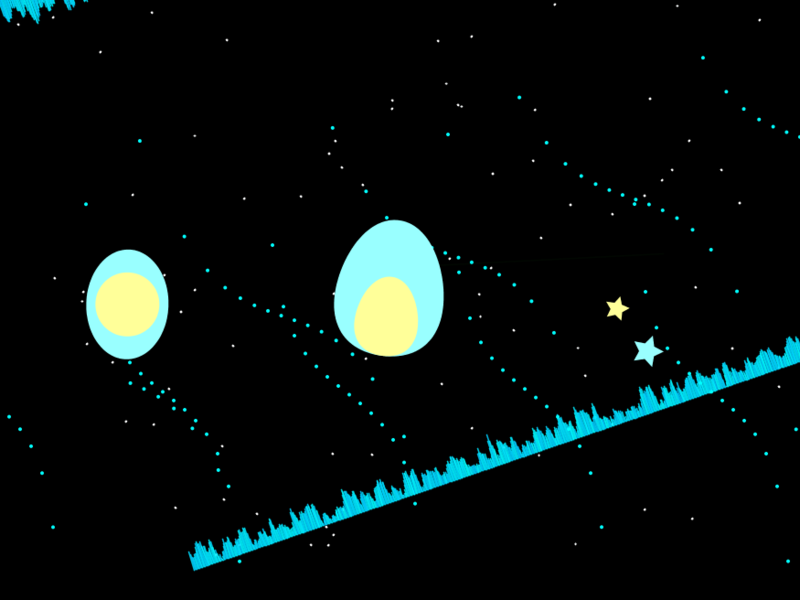 In this case, it looks somewhat like the surface of the ocean, on which the egg drifts ‘aimlessly’. 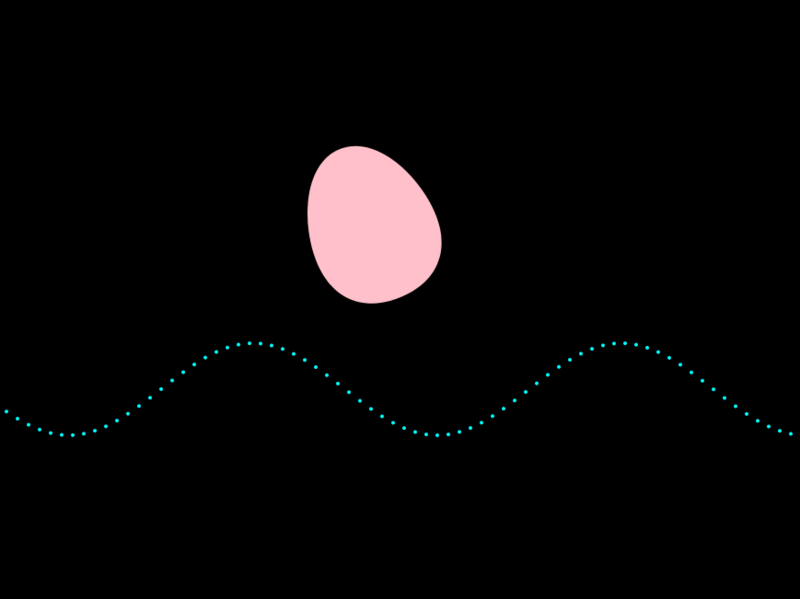 Yet the egg remains in the center of the canvas, whilst the wave flows by, indicating that the egg is the protagonist, and that the surroundings are simply adding contexts to the story. I proceeded to experiment with the elements that would make up a more intriguing plot-line. For instance, this screenshot below contains a hanging glacier, along with red-hot lava at the bottom. There are bubbles floating up from (which later turned into stars in a starry night-sky, based upon the change of meaning I attributed to the piece). I switched the sine wave into tangent-a waves, and also flipped them from horizontal to vertically positioned. On the there is a faint sun-ray (hard to spot) on the top left corner, which I imitated from Grace Hertlein. I then tinkered with the ‘protagonists’ by adding more organisms and constructing a relationship between the organisms. This organic sub-system is unified by periodicity. Although each individual follows its own track, its cycle of movement coincide with each others’ temporally. 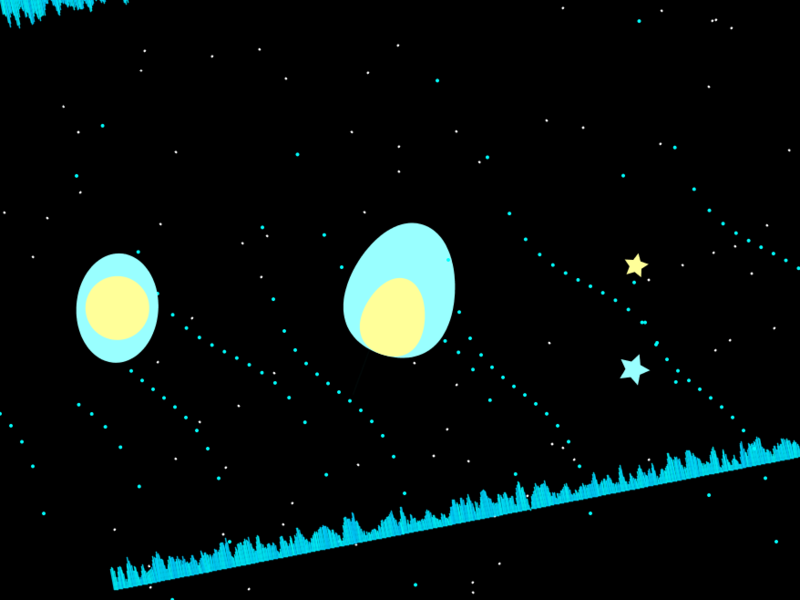 The original egg follows the rocking motion, the new egg follows the hanging swinging motion, meanwhile the two stars follow curved, intersecting looping paths. I linked their movements by applying the same rotation variable, only varying the co-efficient. I have to admit that trial and error played a significant role in the development of this piece. I tried to imitate planetary orbiting motion with an additional rotate(radians( )) function by a linearly increasing the angle. However I made a mistake and misplaced this line of code. The result was shocking – the whole canvas started spinning, the effect was like the fast-forwarding night sky video on the discovery channel. I got a refreshing spark of inspiration from this ‘error’. 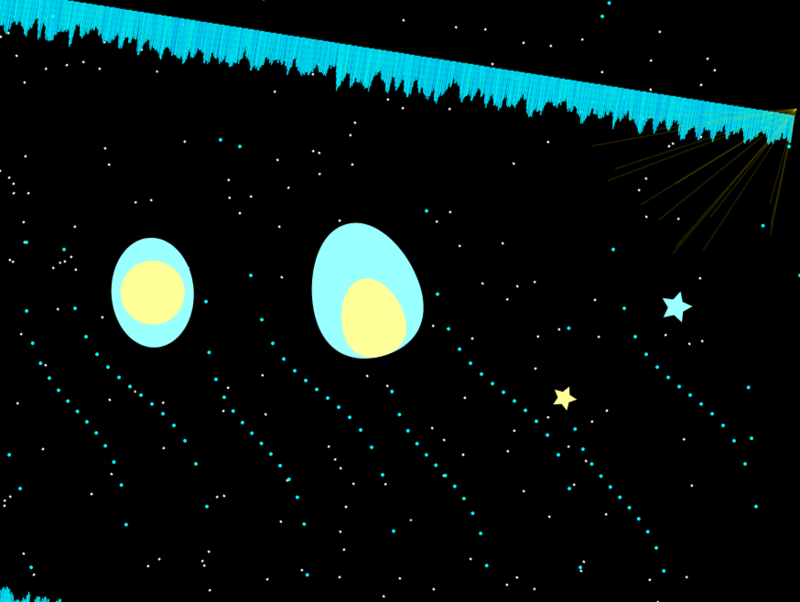 I realized if I put the rotation line above all the codes for the environment and then add another counter-rotation right below it, I can visually separate the organism and its surrounding environment. Cycle after cycle – the ‘galaxy’ spins back – the pattern is somewhat difficult to track by first glance, because the environment has a certain complexity. I would have a hard time discerning it myself if I didn’t build it step by step. 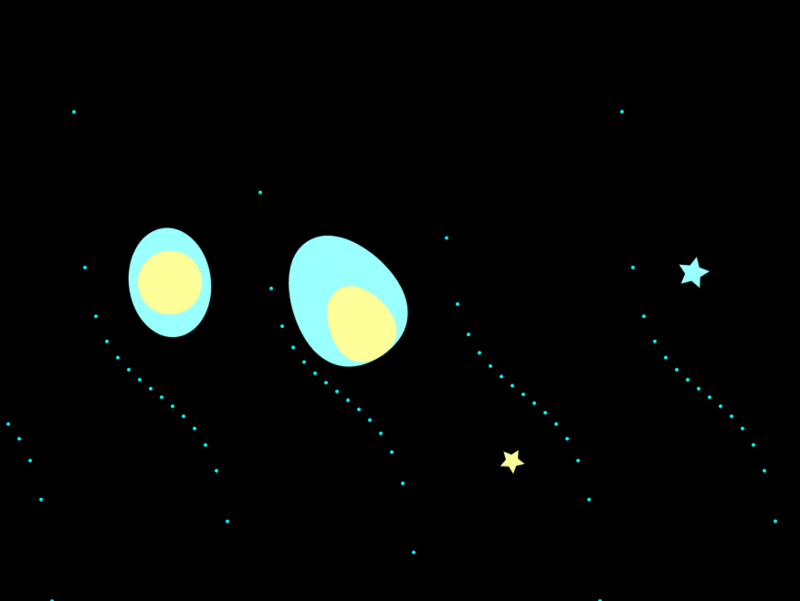 Upon closer observation, one would realize that the rocking + swinging motion by the organisms slow down when the ‘galaxy’ rotates back into the canvas. Immediately after, it speeds up again, as if getting anxious for the next return of the ‘environment’. From a concrete interpretation, one can infer that the environment provides nutrients, energy and nourishment for the organisms; thereby the organisms behave differently when interacting with the environment. 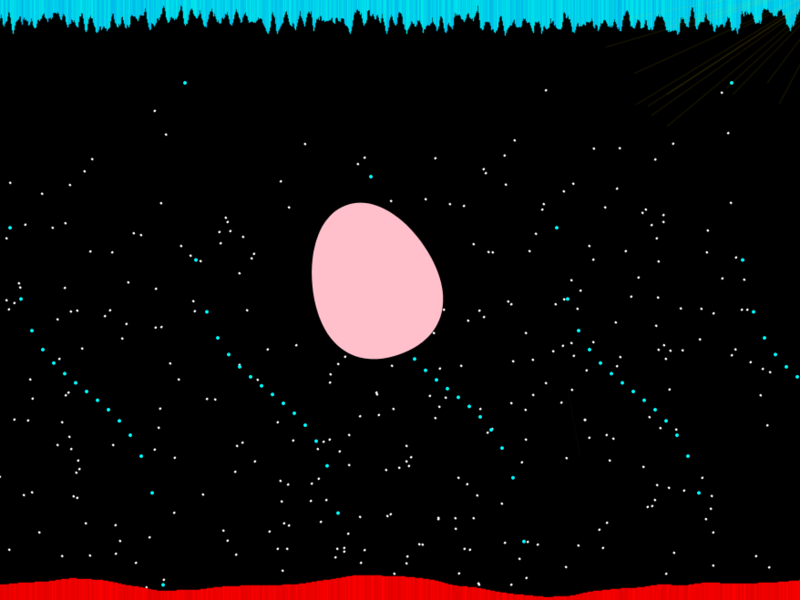 I chose an egg because it is representational of one of the most fundamental life forms, out of which intelligent beings evolve. As stated above, the majority of the classes & objects I wrote represented a materialistic entity in the natural world. On the other hand, the motions were predominantly abstract in the sense that, they deviated from the movements these concrete representations were expected to follow. 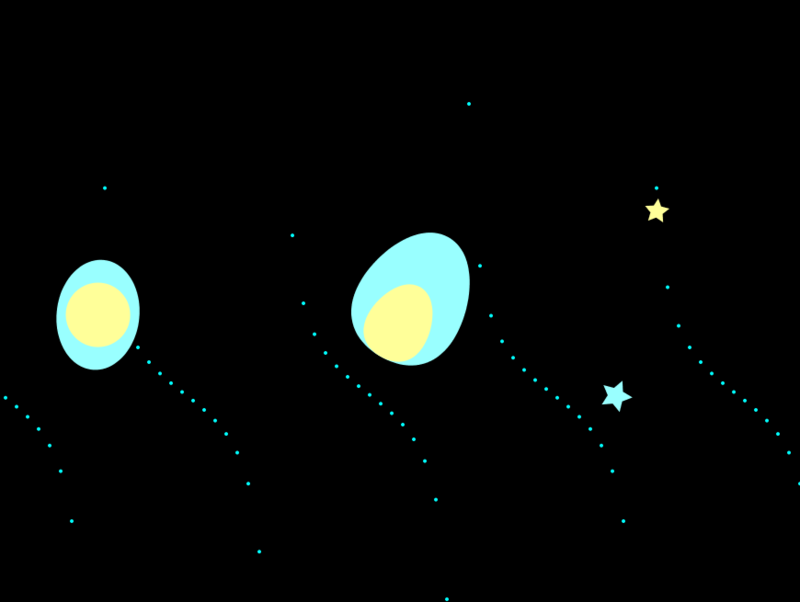 For instance, it is quite unnatural to see an egg rhythmically rock left and right in a cyclical fashion without falling. It goes without saying that a glacier rotating around circularly is equally strange. This system does not directly portray human beings. Nevertheless, if we are being frank – we, just like the Egocentric Egg, undeniably perceive ourselves as the center of the ‘universe’. Nature revolves around us; nature serves us. We are the engine of the system and we set the rhythm. Our system marches to the beat of our drum.